Bisotun, the most grand limestone wall in the world with 5km width and 1200m heigth is situated at 600 km south-west of Tehran in Zagros chaine. The Bisotun festival started at the initiative of a French guide, François Bernard and an Iranian climber Ebrahim Nowtash in october 2010. after the second edition of this festival another French guide Guy Abert has prepared the topos of the tracks which you can find and print them on the http://abert.fr. There are about 100 routes multipitch sport and traditional on the wall that 50 of them are sports climbing equipped with bolts and chaines. Cliffs of Noghre Darre near caravanserail. Cliffs of Cheshmh Sohrab near Bisotun. Chalabeb a sport climbing area close to Bisotun wall Many sports climbing near Kermanshah city. But the part of the wall Farhad Tarash in front of the Caravanserail and its valley is now forbidden to climb, because of the frescoes and monuments. 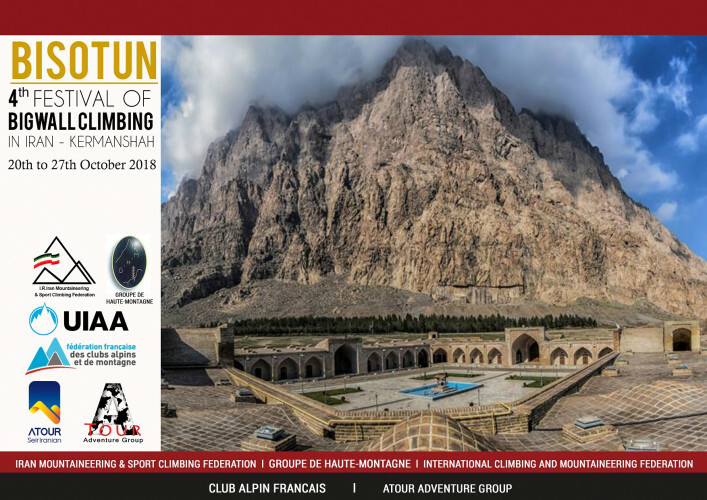 This year the I.R.Iran Mountaineering & Sport Climbing Federation intended to hold the 4th Festival Of Big wall Climbing in “BISTOUN” in cooperating with UIAA, FFCAM, GHM and Atour Adventure Group© in Kermanshah.